Geneva, June 6th 2017 – International IoT experts from the IoT-Europeans Platforms Initiative (IoT-EPI), funded with 50 Mio € by the EU, will present their support programmes for startups and SME at IoT Week Geneva 2017 from June 6th to 9th. IoT-EPI promotes European knowledge exchange through seven research and innovation projects and invests up to 5.5 Mio € in approx. 100 startups and IoT projects in 12 open calls until the end of 2018. Currently, in two open calls by the projects BIG IoT and bIoTope, startups can apply for 720,000 € in total. In Geneva IoT-EPI hosts several workshops, engages with startups at a special meetup at Impact Hub and mentors young developers at the IoT Week Hackathon. By the year 2020 there will be more than 20 Mio connected devices such as automotive systems, smart TVs or real time location sensors for healthcare. IoT-EPI was formed to build a vibrant and sustainable IoT ecosystem in Europe. Seven research and innovation projects make their technology accessible and introduce funding possibilities to young entrepreneurs. SMEs or startups who are interested in implementing developed technologies in their own context, have the option, to submit their proposals in open calls. Currently, two large IoT projects offer funding: BIG IoT (total of 300,000 €) and bIoTope (total of 420,000 €). The calls are mainly focusing on interoperability in different Smart Cities. Industries of interest are Energy Management, Electric Cars, Traffic, Mobility and more. BIG IoT will accept applications until the 16th of June 2017. The deadline for the bioTope call is the 22nd of August 2017. The IoT-EPI programme displays their ideas at IoT week Geneva. Experts from all over Europe (e.g. Fraunhofer, Siemens, Bosch, Atos) will be present at the IoT-EPI booth (Nr.16), to share their insights about innovative platform technologies. Free Meetup for startups at Impact Hub Geneva: IoT-EPI invites interested entrepreneurs to a free networking event on June 6th at 6:30 pm to the co-working space Impact Hub. The event “Let’s talk IoT platforms!” introduces IoT platforms and funding possibilities with up to 150,000 € for each project. Knowledge Transfer – Workshop with IoT experts: The IoT-EPI experts are hosting a workshop on June 8th (2:00-03:45pm, Room 17). Speakers like Sergios Soursos (Intracom Telecom), Arne Broering (Siemens), Ullrich Ahle (FIWARE Foundation) and Srdjan Krco (DunavNET) will explain the benefits of being part of the EU ecosystem. Hackathon: IoT-EPI will also be offering mentorship and API’s at the Hackathon at IoT week Geneva (6th-9th of June). Rob van Kranenburg and Iker Larizgoita (TagItSmart!) are supporting developers with their expertise. IoT-EPI is a European Initiative supporting the EU-funded H2020 projects on IoT platform development. At the core of IoT-EPI are the seven research and innovation projects: Inter-IoT, BIG IoT, AGILE, symbIoTe, TagItSmart!, VICINITY and bIoTope. 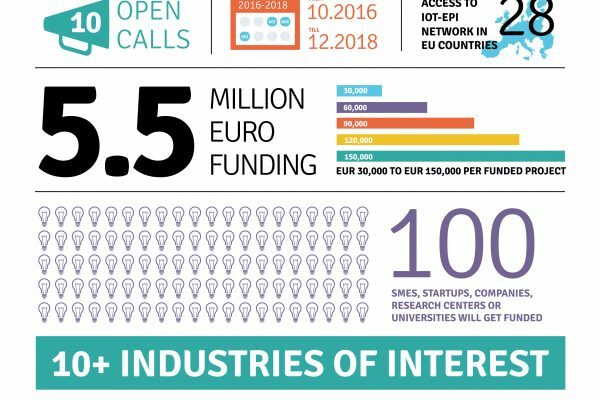 IoT-EPI has a total funding of 50M € and a partner network of 120 established companies. The research projects develop innovative platform technologies and foster technology adoption thorough community and business building. For further information visit the IoT-EPI website, Social Media Channels: Twitter LinkedIn Facebook or sign up for the IoT-EPI newsletter. Images are available.